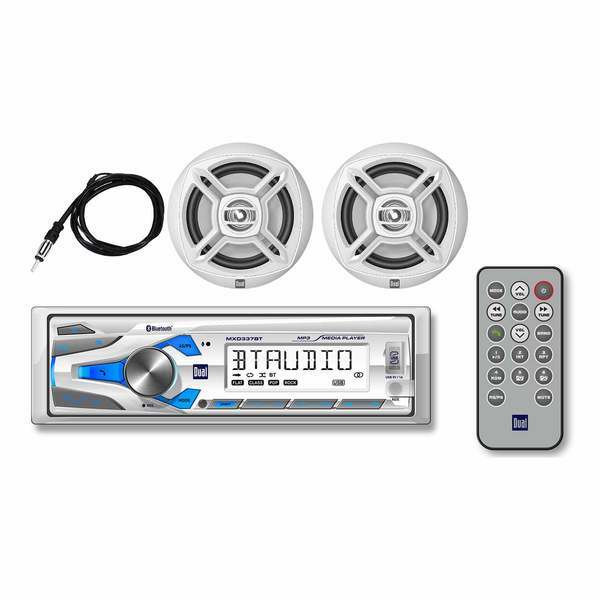 Get wireless and water-ready music on your boat with the complete MXCP47BT Marine Digital Media and Bluetooth Receiver/Speaker Package from Dual Stereos. The MXCP47BT comes with everything you need to create your perfect sound system on your boat — even the speakers! With this combo package, you can be assured of device compatiblity and ease of cohesive installation. This water-resistant receiver lets you personalize your listening experience and will play all your digital music. It comes with a hand-held remote control, antenna and two 6.5" marine grade speakers. Listen From a Wide Variety of Sources: This device lets you listen to all of your digital music! With built-in A2DP/ AVRCP Bluetooth, USB (with charging) and AUX inputs and AM/FM radio with 12/18 preset stations, you can take your music with you offshore. Hands-Free Calling: Now you don't have to put down the fun to pick up the phone. With the internal mic and bluetooth for hands-free calling, you can remove the stress of exposing your smartphone to the water. Fine-Tune Your Experience: This device has 4 preset EQ Curves so you can create the perfect listening environment whether you're prefer Pop, Rock, Jazz or Flat tunes. It comes with electronic tuning with 30 station presets and auto station-store to enhance your entertaining abilities. Create player control profiles with compatible smartphones and music players so you don't have to start from scratch every time you board. Go Totally Wireless: The stereo comes with its own full-function hand-held wireless remote, letting you control your music from anywhere on your boat. What's more: any bluetooth-connected device can be used as a wireless remote, too! Water-Ready: This unit has been tested to perform in the marine environment. A conformal-coated circuit board, PET wrap on the top and sides of the chassis, UV-resistant exterior construction and silicone covers on the front panel auxiliary input make the MXCP47BT durable and water-resistant. All the Pieces: This package comes with the MXCP47BT receiver, two DMP672 speakers, a MAW40 40" Soft Wire Antenna and a wireless IR remote. With all the pieces in one box, you won't get out on the water and find out you're missing parts! In this day and age of complex electronics, this product package gives you an easy plug-and-play option without sacrificing access to your high-tech devices. Cutout Dimensions: 5 1/8" dia.